Preston have just had their best week of the season and managed to do that without being at their best. Birmingham went the same way as Middlesbrough and Blackburn, as North End won three games on the spin for the first time in 2018/19. The unbeaten run, which now stands at 12 matches, had been punctuated by four draws here and there. Those four draws had all come at Deepdale and a fifth looked on the cards until the most dramatic of finishes on Saturday afternoon. The game had moved into its 94th minute when Sean Maguire rose to guide home a header from Daniel Johnson’s corner. 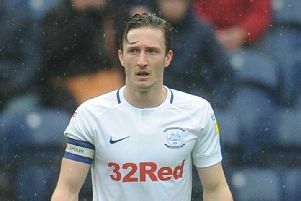 Pandemonium enveloped three sides of the ground as PNE’s players celebrated in front of the Alan Kelly Town End – Declan Rudd’s dash from the far penalty box to join in would have given Usain Bolt a run for his money. This was the narrowest of wins from a game which had 0-0 written all over it. Both defences had been on top, efforts on target very much at a premium. Conditions were filthy, with a swirling wind whipping heavy rain around. These are the afternoons though, which can make such a difference to a season. One point turned into three in a turn of Maguire’s neck muscles and just how valuable will that prove in the final reckoning? In the shorter term the win carried Preston up to seventh place, outside the top six only on goal difference and just a point shy of fifth place. Were they really propping up the Championship back on October 2 and was this the team in 17th position on New Year’s Day? Yes is the answer to both of those questions, North End’s turnaround in fortunes these last two months as dramatic as Maguire’s late winner. How far can they go? No one has a crystal ball but with eight games remaining once action resumes at the end of the month, Alex Neil’s men are in the thick of it. Neil had spoken several times about a desire to keep the season alive, still be in with hope of the top six going into the final few games. They’ve done more than that and have to be considered as genuine play-off contenders. Successful teams will find a way of winning when they aren’t at their best and PNE have done that three games running in a week. They dug in at Blackburn to protect an early lead and then put a dodgy hour of football behind them at Boro to take full advantage of the home side going down to 10 men. As an attacking unit, North End struggled to hurt the Blues. The better chances of the game fell the visitors’ way but even those were few and far between. Birmingham manager Garry Monk was to claim his side ‘totally controlled’ the game. That was stretching a point I would argue, although there were spells when they were well on top – the first half hour in particular Monk’s men were in the ascendancy. North End had opted to be quite direct, Neil having seen a pattern in the results of the visitors. Some of the sides who had tried to play football against the Blues had come unstuck. Others who favoured to be more up-and-at-them had enjoyed better fortune. Hence Jayden Stockley was rewarded with a start after his winning goal in midweek. Stockley was PNE’s focal point, Maguire starting the game playing off him to try and pick up the second ball. It didn’t work, with Neil forced to reshuffle the front line a few times over the course of the game in a bid to find a way through. In the end it was a corner which unlocked the Birmingham back line, Maguire meeting the flag kick from Daniel Johnson to head his third goal of the season. Preston certainly missed the craft which Paul Gallagher and Alan Browne provide. Both sat out this one due to injuries picked-up during the Middlesbrough win. A glance at the bench gave more encouraging news on the fitness front, with Callum Robinson and Loius Moult among the substitutes. Robinson got his chance for the last half hour, Moult having to wait with an injury to Andrew Hughes meaning Neil had to put Josh Earl on. PNE started the game in a 4-2-3-1 formation which at times resembled more of a 4-4-2. Brad Potts, back after two games out injured, played on the right and Lukas Nmecha on the left. Maguire buzzed around Stockley as a number of long balls were pumped up to the former Exeter man. With the hosts unable to get any sort of grip on the play, Potts was switched inside and Maguire moved wide. Rudd made good saves a few minutes apart from Che Adams and the lively Jacques Maghoma. If anyone wanted to play well in this game, it was the Lilywhites keeper. Against Birmingham at St Andrew’s in December, he had let a harmless ball bounce through his legs to concede the first goal in a 3-0 defeat. Rudd has put that horrible moment behind him and gone on to play very well, this his sixth clean sheet since then. North End’s best spell of the game was in the last 20 minutes or so. Robinson brought with him off the bench a bit more of a threat, however I felt that Brandon Barker had more of an influence when he joined the action. Preston should probably have scored the winner a few moments before they actually did. Robinson, Maguire and Ben Pearson were involved in a swift counter-attack which put Johnson through on goal. As he shaped to shoot in the box, Maikel Kieftenbeld put in a fine challenge to take the ball behind for a corner. Johnson took the corner left-footed from the right, it travelling towards the far post where Maguire rose on the edge of the six-yard box to steer a header down into the bottom corner. The place went berserk, the wind and rain temporarily forgotten. Far from a classic this might have been but it got the job done.